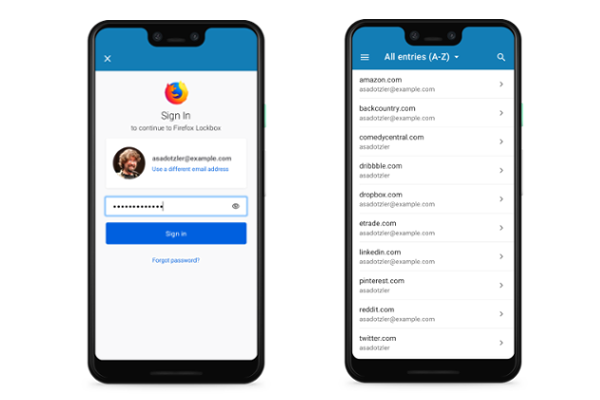 Mozilla releases Firefox Lockbox password manager app for Android. Today Mozilla announced the availability of Firefox Lockbox for Android users. Firefox Lockbox is a secure app that keeps user's passwords with them wherever they go. Since its iOS launch, Firefox Lockbox has had more than 50K downloads, and was most recently optimized for iPad. Firefox Lockbox is based on another successful Test Pilot experiment. Unlike a traditional password manager, Firefox Lockbox is a simple app that gives easy access to the passwords you have already stored in your Firefox browser. No extra set-up necessary. This makes Firefox Lockbox the perfect solution for people who want to secure their personal information, but may not have time to choose and transfer all of their passwords into a password manager. Firefox Lockbox allows you to easily retrieve your password on your phone so you can log in without a hitch. Plus, you can also use Face ID and Fingerprint touch to unlock the app, making it easy to securely access your passwords. Firefox Lockbox works with autofill to make the transition from using your Firefox desktop browser to mobile seamless, by automatically filling in your passwords saved on desktop to your everyday apps like Facebook or Yelp, on your mobile device.